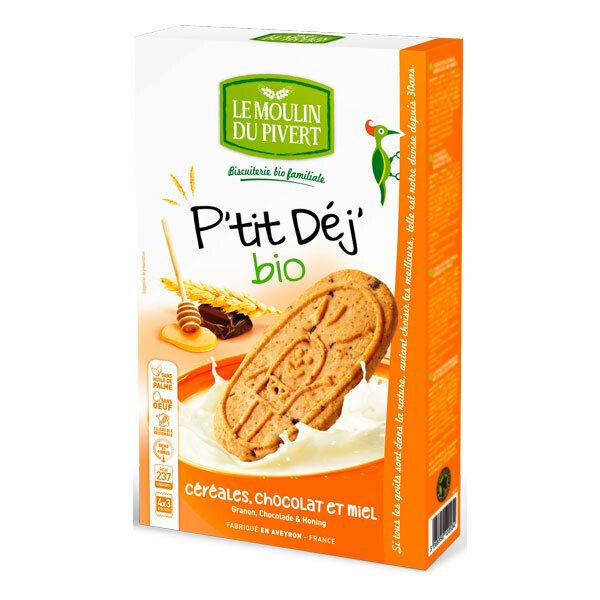 What more delicious than chocolate, honey and cereal biscuits made in France without GMO? Delicious for breakfast! Ingredients: * 51.4% cereals (wheat flour T65 *, oats *, T130 * rye flour, barley flour *), unrefined cane sugar *, sunflower oil *, chocolate chips * 7.9% (sugar cane *, cocoa mass *, cocoa butter *) * 5.7% honey, cocoa butter *, hazelnut powder *, oat fiber *, raising agents: sodium bicarbonate and ammonium bicarbonate, extracted * malt, salt, lemon juice concentrate *.